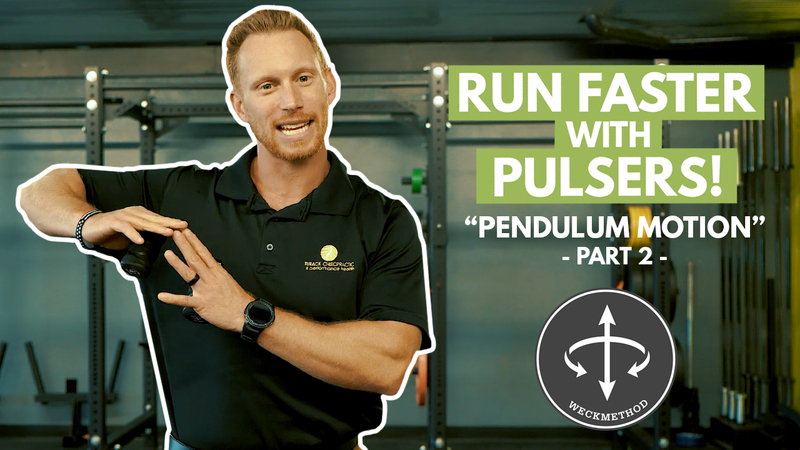 In Part 2 of the Pulsing Series, Dr. Dan teaches you the “Pendulum Motion,” the next step in learning how to incorporate pulsing into your running technique. We got the WeckMethod ProPulsers and we’re teaching you how to run stronger, be faster, and develop total body movement. We demoed the Pulsers and we talked a little bit about the auditorial and sensory feedback in our first video. Our second video is going to talk about the Pendulum Motion and how we teach our clients in the gym and in office on how to pulse, which will ultimately make you faster and stronger. Alright, we’re going to set up with the hold. For Step 2, we’re to learn pendulum. What I want you to envision if you’ve ever seen those little desk games where you pick a ball up and it smacks the line of balls and the other one fly up to make it go back and forth. That’s exactly what we want Step 2 of “Learning How to Pulse” to look like. We pull the arms out, wrist out, and we keep the Pulsers somewhat close together, but they’re not touching. All we’re going to do is create a “V” that we can change either the height of or make it a wider “V.” This is an easy exercise before we even initiate the pulse we’re going to just swing gently and then we start to initiate the pulse, that means I want to hear the little beads in there get that up to down movement. So, were initiate the pendulum pulse, when you see how this look the kinetic energy the movement appears potential, then we make it kinetic and was store all this energy up into my left arm and we throw it back down. What we got here is just like that little ball game, we’re a creating as a nice symmetrical right to left, movement. Were going got start slow, down and up and once you find you’re rhythm, it going to be really easy for you to flow this movement at different heights or nice and tight or a wider “V”. That called the Pendulum ProPulse and that’s how we teach it to our clients. We got the wrists out, we got the “V” down and up, and keeping a little of tension-packed down into the mid back. I like to keep my head up and really focus on driving through the lats. That’s Step 2 of “Learning How to Pulse”. Try to string the movements together and if you forget anything, go back to the up and down movement before you transition to the left and right movement. Follow up with us on Step video so you can learn how to integrate the front the back movement.